A Professional Roof Inspection Report from us can save you thousands of dollars. What we do: Costa Mesa roofing specializes in performing roof inspections for potential home owners, mortgage lenders and in some instances we make sure the roof meets or exceeds FHA standards. We give you an unbiased opinion on the condition of the roof and the structural members related to the roof coverings. This opinion will include a complete analysis of the existing roof system (s), replacements costs, repair costs, recommendations, pictures of anything you will need pictures of, and a comprehensive four page Roof Inspection Report. By the time you have spent a little time with us and reviewing our findings and the report you’ll know more about your roof than the average roofer would or could tell you. How do we do that: We will meet you at the property with a guaranteed time of arrival, perform an exterior building perimeter checking for signs of leaks or roofing related problem that you should know about and walk the interior of the property using a high powered flashlight to check ceilings and walls for any sign of a roof leak. It is critical to have a trained eye for this part of the inspection. Many problems related to the roof only show signs below the roof. In fact there may be no sign of damage to roof itself. That is why it is common for many roofers to miss potential damage because they did not do a thorough enough job on the ground. 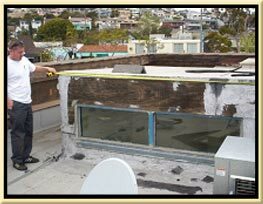 The last part is the visual roof inspection performed by a highly experienced roofing inspector. What we don’t do: Send out an employee to do this service or simply pop up a ladder, go up on the roof for a few minutes, look for something they like to repair or replace, and then come down and give you the bad news. This may be free in some instances but don’t be fooled. It could turn out to be the most expensive free advice you’ve ever had. In this case bad advice is not free it could be very costly. 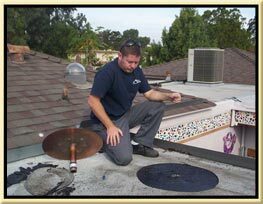 What goes into a Professional Roof Inspection: Costa Mesa Roof Inspection Report and Service gives the buyer an impartial, physical evaluation of the overall condition of the roof and items that need to be repaired or replaced. Our inspection will provide a detailed four page report that will be emailed to you (the client) within 24 hours of doing the inspection, and we will provide pictures of important repair items via a link on the internet that will allow you to simply access the pictures. The report will cover the condition of the roof, the type of material used, the roofs reasonable life expectancy, and it will consider any additional roof components such as structural members, dry rot that involves the roof, and address the roof ventilation system. Be an Informed Buyer: It is your responsibility to be an informed buyer. Be sure that what you buy has a satisfactory roof covering in every respect. You have the right to carefully examine the roof on your potential new home with a qualified Roof Inspector. Click here and fill out the form to schedule your $189.00 Roof Inspection.